Root Canal Therapy – we recommend our resident root canal specialists. Additional specialist training and experience go a long way in increasing the likelihood of treatment success in this field. Root canal therapy (or RCT) is treatment of the infected nerve of a tooth. When bacteria penetrate the centre of the tooth, called the pulp – which consists of sensitive nerves and blood vessels inside the root canal – this part of the tooth can become inflamed and infected, causing pain. If the condition is left untreated, an abscess can form at the root tip and bacteria can spread to the jawbone and the rest of the body. Infection within a tooth can be treated either by extraction or with root canal therapy, the latter generally being the preferred option. The purpose of root canal therapy is to save the tooth. This is done by removing the affected pulp and cleaning the nerve canals with an anti-bacterial preparation, followed by the placement of a temporary filling inside the tooth until a permanent filling and/or crown can be placed. The immediate benefit of root canal therapy is significant pain relief. In the longer term, the treatment allows for preservation of the tooth. The alternative, being removal of the tooth, results in a space, which should then be filled with a dental bridge or an implant and crown – both expensive treatments that require ongoing maintenance. At Smile Solutions our practitioners will always strive to save a tooth, where possible, rather than remove it. The following four scenarios list typical indications for root canal therapy and how we address them. Tooth damage involving inflammation of the pulp (nerve) can be highly painful and can only resolve with endodontic treatment. Often the patient is distressed and in considerable pain. A prompt response from one of our Dental Board–registered root canal specialists can relieve the distress and pain for the patient. Treatment involves the removal of the inflamed tissue, full preparation of the canal systems and full obturation (blocking up). This process ensures that bacteria are prevented from multiplying in the canal spaces. Prognosis is usually very good and success rates are generally high with this treatment. This situation is when bacteria have infected the root canal system of a tooth; it can be worse than inflammation of the tooth alone. Primary infection of a tooth can lead to an abscess in the jawbone, which – if left untreated – can spread to the rest of the body. Using the most modern equipment we can make sure the canals are as clean as possible, then seal them. 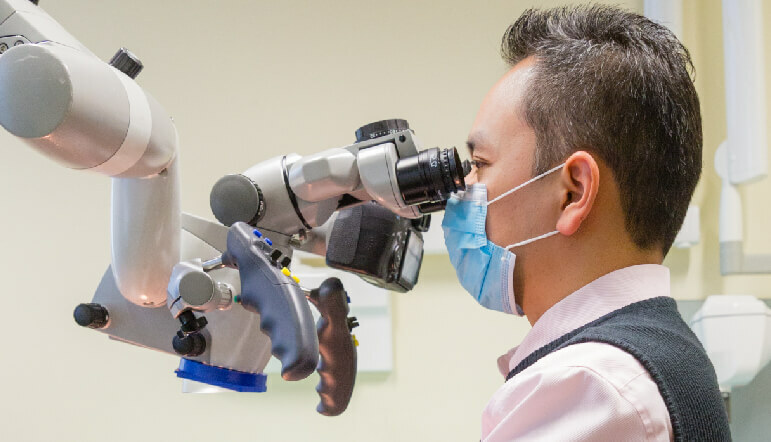 Treatment involves locating all the nerve canals in the affected tooth, then removing bacteria from the contaminated root canal system through the use of irrigants, hand instruments and rotary equipment. This three-pronged approach allows for both chemical and mechanical removal of the bacteria. Once the root canal system is clean, your clinician then places a soft rubber-like material, called Gutta Percha, extending to the tips of the root. If previous root canal treatment has not achieved a satisfactory result, or the canals have become reinfected, a further attempt can be made to remove infection by re-treating the tooth. Reinfection of a root-treated tooth is uncommon but can occur in a tooth with a complex structure. It is more difficult to disinfect teeth involved in re-treatments as the existing root filling first needs to be removed, introducing a range of procedural risks. We can search for any extra nerve canals that may have been missed before. Re-treatment may involve the removal of the original root filling. We also check for any further factors that could compromise the tooth (such as perforations and fractures). We then advise you of our findings so you may choose whether or not to undergo treatment with a relatively poor prognosis. In some cases of re-treatment of a previously root treated tooth, surgery may be required. This could be due to the need to avoid damage to a relatively recent crown or if an untreated portion of the root is not accessible for, or not responsive to, routine cleansing. We can assess the causes of failure and advise surgery only if it is the best option and has a good prognosis. Often we can avoid surgical treatment by first repeating the original root canal treatment of the tooth, which is our preferred option if available. If, however, surgical treatment is deemed the only option, we would apply local anaesthesia before opening the gum tissue near the tooth to see the underlying bone and remove any inflamed or infected tissue. A small portion of the root tip is also removed. A filling may be placed to seal the end of the root canal and a few sutures are then placed to help the tissue heal. What is the Advantage of Root Canal Compared with Tooth Extraction? Each one of your teeth is meant to complement its neighbouring and opposing teeth. Losing one tooth not only has a cosmetic effect but also has a detrimental impact – which can be almost immediate – on the neighbouring and opposing teeth. A typical outcome is a misaligned bite that causes teeth to move or spread out to fill the space. Therefore the clear advantage of root canal therapy over tooth removal is that it saves a natural tooth and, in so doing, preserves your natural occlusion (bite). Modern dentistry offers many solutions to the loss of a tooth but none of them is as desirable, in terms of both cosmetics and function, as keeping your natural tooth. The main disadvantage of root canal therapy is that it does weaken the remaining natural tooth to some extent, though this can be significantly overcome with the fitting of a crown or similar restoration. What Can I Expect Following Root Canal Treatment? Immediately after root canal treatment, while the area is still numb, you should be careful with what you eat and drink so as not to cause any damage to the treated tooth. We recommend that you avoid any hot, hard, crunchy or sticky foods or drinks, and that you try to avoid chewing on the treated side of your mouth while the temporary filling is in place. As a follow-up treatment, it is often advisable to have a crown or similar tooth restoration fitted so as to protect the already compromised tooth and aim to prevent cracking or splitting of the remaining tooth structure. Once such protection is in place you can eat and drink as normal. It’s important to keep up good oral hygiene after root canal therapy. You can still clean your teeth as normal, though we recommend you be gentle when brushing and flossing the treated area at first. As well as your home routine, you also need to follow up with regular check-ups with your general dentist and cleans with your hygienist to ensure good oral health. You can expect many years of functionality from any tooth treated by a specialist endodontist. However, for a tooth to require root canal therapy, it has usually already suffered decay, wear or trauma, any of which can compromise the structural integrity of the tooth. Because of this, there are instances in which root canal treatment does not achieve a definitively favourable result long-term. Root canal therapy is not painful as it is only done when the tooth has been completely numbed. It will actually ease the pain and suffering caused by an infected tooth. However, for many people the thought of undergoing any dental treatment, no matter how simple or complex, produces feelings of anxiety. If you have any anxiety about your root canal treatment, talk with one of our endodontists about treatment options. After your root canal treatment your tooth may be sore or tender. This is a normal symptom of your body’s healing process and usually lasts only a few days following your treatment. Are There any Risks Associated with Root Canal Treatment? As with all dental procedures, there are risks associated with root canal treatment. Some are procedural – that is, they arise during the treatment process. The main procedural risk is for the root canal instrument (commonly known as a file) to fracture inside the root canal. This risk is greatest in patients whose canals are severely curved and calcified and/or hard to access. Fracture of files in these cases is best managed by an endodontist. Another procedural risk is tooth fracture. This can occur in the period between starting root canal and having a crown placed on the tooth. Because of this, it is recommended that all root-treated teeth are fitted with some sort of restoration shortly after the completion of root canal treatment. some post-treatment sensitivity or pain either from the trauma of treatment or from biting when the tooth super-erupts as a result of inflammation. Problems that can arise some time later are infection or a split in the root or tooth, requiring its extraction. In the majority of cases this can be avoided by the placement of a crown. If the tooth does need extraction at some stage in the future then sometimes an implant-supported tooth can be an option. The risk of complications from root canal therapy is greatly reduced when treatment is carried out by a specialist endodontist, rather than a general dentist. 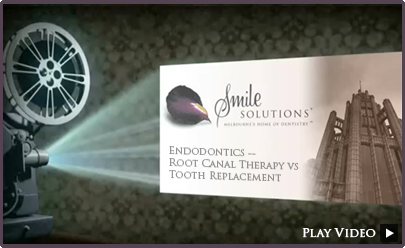 At Smile Solutions one of our experienced endodontists will handle your treatment. What if I Need Emergency Root Canal Treatment Outside Business Hours? At Smile Solutions we understand that not all dental emergencies occur during business hours and our friendly staff can cater for unexpected emergency dental visits at short notice, seven days a week. Our clinicians are skilled at handling all emergency situations, from root canal treatment to infections, denture repairs, impacted wisdom teeth and more. With all the latest dental technology at our fingertips, we are equipped to provide any emergency treatment. 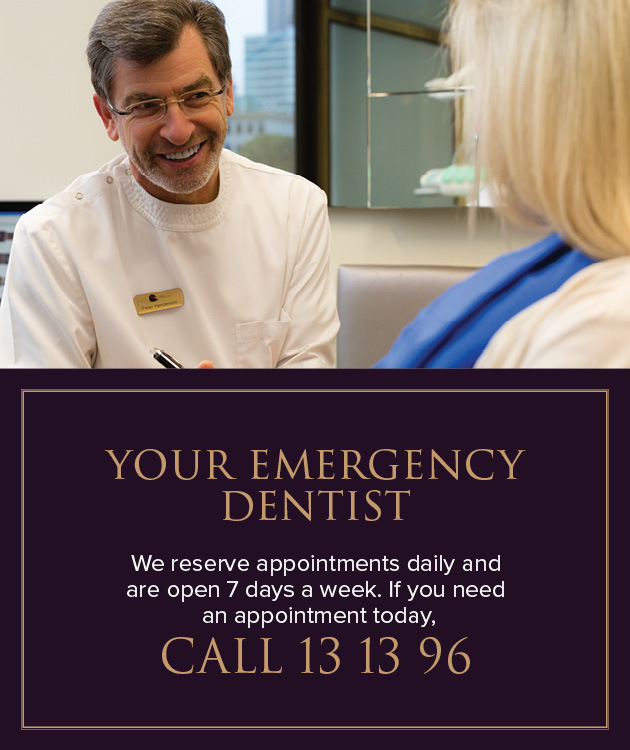 Outside of these hours, Smile Solutions patients can obtain emergency dental advice by calling 0400 369 359. If you require emergency root canal therapy we recommend one of our registered specialist endodontists. Endodontists, also known as root canal specialists, are registered specialists who focus on treatment of the tooth pulp (nerve) and the tissues surrounding the root of a tooth. They perform a variety of procedures, including root canal therapy, endodontic retreatment (where the tooth pulp has become diseased or injured), treating cracked teeth and treating dental trauma. 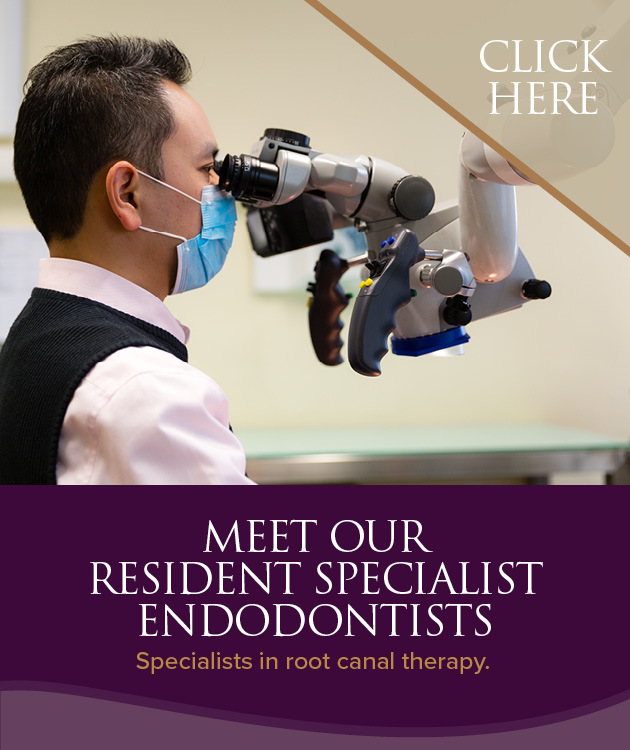 Endodontists are dentists who have specialised in the field of root canal therapy by undertaking a further three to four years of full-time training in addition to their initial dental qualification. In Australia they are registered with the Dental Board of Australia, which means you can verify their credentials on the website of the Australian Health Practitioner Regulation Agency (AHPRA). All dentists have training that qualifies them to carry out root canal therapy. However, depending on the complexity of the tooth structure and any pre-existing conditions, we believe it is better to consult a specialist endodontist who has specialised training. You do not need a referral to see an endodontist and in most cases endodontists and general dentists work together to treat any particular case. Who Would Conduct my Root Canal Procedure?